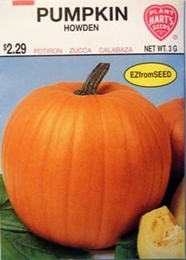 Original strain of the best selling pumpkin in the US. Similar to Connecticut field, but more uniform averaging 20-25 lbs. Produces symmetrical round fruit with extra thick flesh that are ideal for fall decorations, Jack O'Lanterns or making pies. 170 Seeds/oz. Plant 1/2oz per 100ft row.